This article was originally written by Al Churchill for our newsletter. 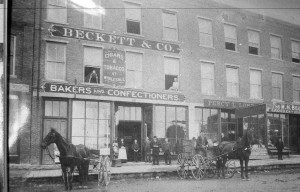 As a young fellow growing up in Calais in the 50’s and early 60’s, Beckett & Company was the store on Main Street where a kid could buy molasses gems, honey sticks and broken fragments of chocolate by the ounce at a very reasonable price. In fact, I blame my addiction to chocolate on Dave and Phil Beckett, friends and classmates, who occasionally worked at the store and were quite generous when reading the candy scales. I didn’t know and certainly wouldn’t have cared that Beckett & Co. was probably the oldest business in Calais and possibly the St Croix Valley other than the Advertiser and Courier and wasn’t just a candy store. From the early 1900’s Beckett and Co. was the primary wholesaler for nearly 150 neighborhood stores from Eastport to Vanceboro, bottling nearly all of the Nehi, Royal Crown Cola and Cream Soda consumed by my generation and employing up to 30 people. If you bought a pack of Chesterfields, a can of corn, a cake mix or a jar of pickles from the neighborhood store, it had almost certainly been delivered from the Beckett warehouse on Union Street in a Beckett and Co. truck. I have a vague recollection of occasionally seeing a very old gentleman, always in suit, in the store. His aged appearance shouldn’t have been surprising as the gentleman was Frank N. Beckett, Sr. and he was born on August 6, 1862, just days before the Second Battle of Bull Run. At the time he was approaching 100 but had been active in the business for almost 90 years. 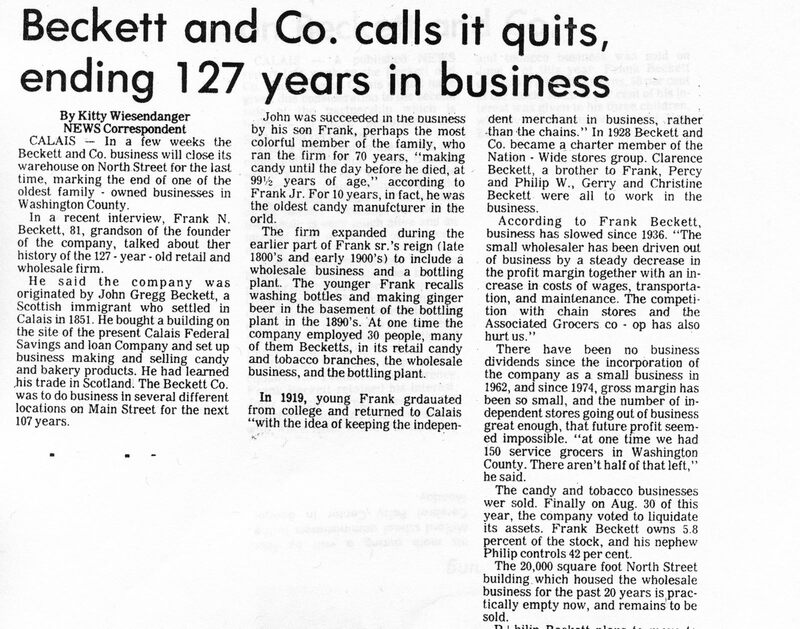 For most people Frank Sr. was Beckett and Co., a legendary candy maker, businessman and civic leader but he was not the founder of the business. The story of Beckett and Co. begins a generation before Frank Sr. with his father, John G. Beckett and therein lies a tale, several in fact. 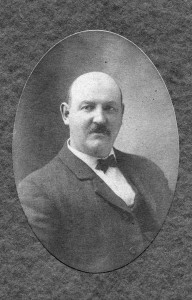 John G. Beckett, known as J.G. by his family, was born May 29, 1828 in Kilmarnock, Scotland and died in Calais, Maine on June 6, 1889. What happened between these dates and what sort of person J.G. really was are somewhat of a mystery. One could believe the Courier’s obituary which claims he was unrivalled as a “public spirited and energetic businessman” whose memory “deserves a tribute more enduring than mere words” or one could credit family history which describes J.G. as a hard drinking, brawling rogue who was irresponsible in family matters and unscrupulous in business. A clue to the truth might be found in the Calais Times obituary which says of J.G. “He was of strong attachments and a brave opponent of all who excited his enmity, or had done him what he believed to be injustice.” Unusual language for an obituary, implying J.G. was a hard man who made his own rules. I suspect this is fairly accurate description of him. Within two months, however, his son had died and on November 9, 1858, J.G. abandoned his business, left his family on Grand Mahan and shipped out of St. John on the cargo ship Adept bound for Glasgow. The Glasgow adventure became a pattern for J.G. He often disappeared from Calais for lengthy periods on rather questionable ventures, leaving wife and family either in the care of others or to carry on the business in his absence. Family notes say the Scotland trip was to visit his family but, in truth, J.G. was looking to make a buck. A journal of the trip shows J.G. spending some of the trip studying the history and economics of New Brunswick in preparation for recruiting immigrants to New Brunswick. At the time Canada was desperately in need of settlers and was willing to pay recruiters by the head for anyone who could plow a field or swing an axe. J.G. saw this as a business opportunity and, billing himself a resident of and an authority on New Brunswick, where he had never lived, he returned to Scotland to convince as many Scots as possible to return with him to paradise. 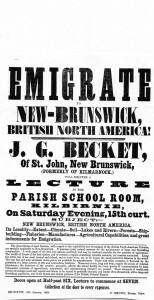 A poster titled “Emigrate to New Brunswick” advertised a lecture to be given by J.G. in Kilburnie, Scotland on January 15, 1859. The claims about New Brunswick were fairly outrageous. The province, according to the poster, had the best soils, best fisheries, most abundant water power and the largest and most flourishing population of any place in the British Colonial Empire. In his journal J.G. 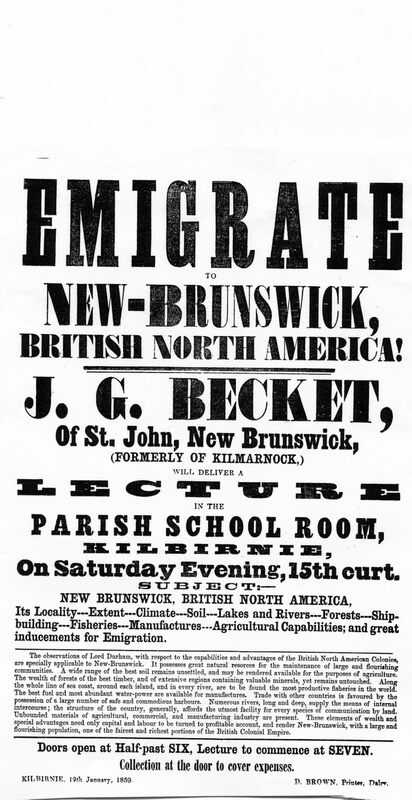 rationalizes his venture as follows “ I hope I shall succeed in my present undertaking and that I may be successful in inducing many to make for themselves a comfortable home, and for their children a noble heritage in New Brunswick.” I doubt the prospective emigrants realized J.G.’s fund of knowledge about New Brunswick was obtained by reading agricultural reports during his four week journey. We know he was successful in finding at least one Scot to emigrate, his half brother Alexander. Alexander returned with J.G. 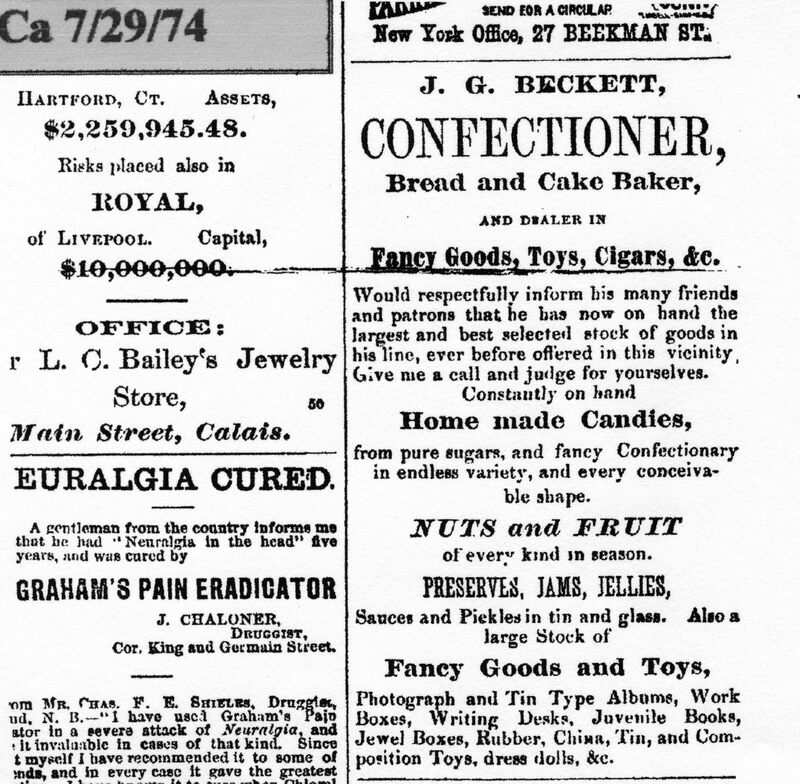 to St. John in 1860 and eventually settled in Eastport where he also established himself as a confectioner. Alexander was the patriarch of the Eastport branch of the Beckett family. Many may remember Harold G. Beckett, a prominent citizen of Eastport whose son, John may be the last surviving member of Alexander’s line. J.G. spent about a year in St John after his return and his daughter Maude was born there on March 19, 1860. Maude became well known in Calais as a businesswoman who operated a fine goods store for many years just up the street from Beckett and Co. She also taught for years in the small school near the corner of High and Monroe streets. By 1861 J.G. 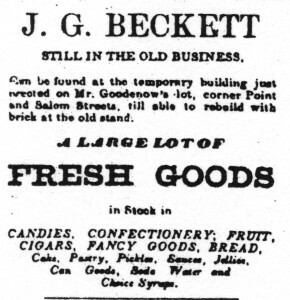 had returned to Calais and according to the Advertiser “ has taken up the building occupied by Geo Cole and fitted it up in first rate shape for the manufacture and sale all kinds of confectionary, pastry, ice cream beer, etc. Mr. B is the finest caterer for the public palate this side of Boston.” Frank N. Beckett was born in the store on August 6, 1862. Three years later, on December 12, 1865, Frank’s brother and future business partner, John G. Beckett, Jr. was born. When the boys weren’t in school they were working in the family business. According to Frank he was professional baker, candy maker and bottler by the age of 17 who “understood the manufacture of beverage syrups and ginger and root beer, the generation of carbonic acid gas, the charging of soda tanks, etc.” Frank says he worked in the business without pay until he and his brother bought the business in the 1880’s. 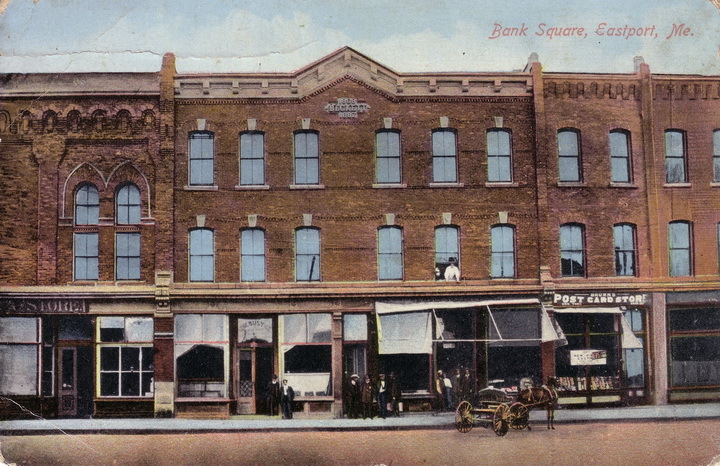 By 1877 he had finally found a permanent home for the business, the building at 139 Main St. which remained the home of Beckett and Co. for nearly 100 years. 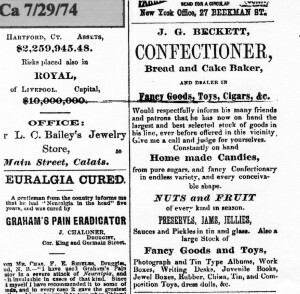 According to ads in the paper, the business was then selling “toys, cigars, fancy goods, bread, cake and Home Made candies from pure sugars and fancy confectionary of every conceivable shape. However the life of a small businessman in Calais in 1870 was easily as difficult as it had been in the 1850’s. 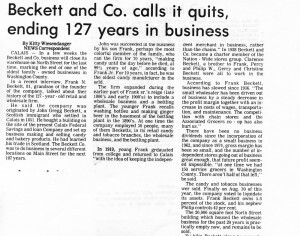 In 1879 Beckett and Co. is not even listed in the Calais business directory and Frank, Sr. says the early 80’s were a very bad time for the business, which may explain why J.G. became an arms dealer, masqueraded as a lawyer, was a not so heroic hero of the Great Boston Fire of 1872 and, with his brother Alexander, embarked on a mysterious enterprise. We know from his 1859 Scotland adventure that J.G. was not one sit idly at home when money could be made elsewhere. According to family history one such chance occurred during the Fenian uprising. In April, 1866 Fenian invasion fever was at a high pitch on the border as our neighbors across the river prepared for an onslaught of Irish revolutionaries who intended to establish an Irish republic in New Brunswick. J.G. saw a business opportunity and purchased a large number of civil war surplus Springfields at a very low price, probably because they were defective. The Canadians across the border were in a panic, and having very few firearms, were willing to buy almost anything. J.G. was happy to oblige and to encourage buying interest he and his friends set fires along the U.S. side of the river to simulate military encampments. 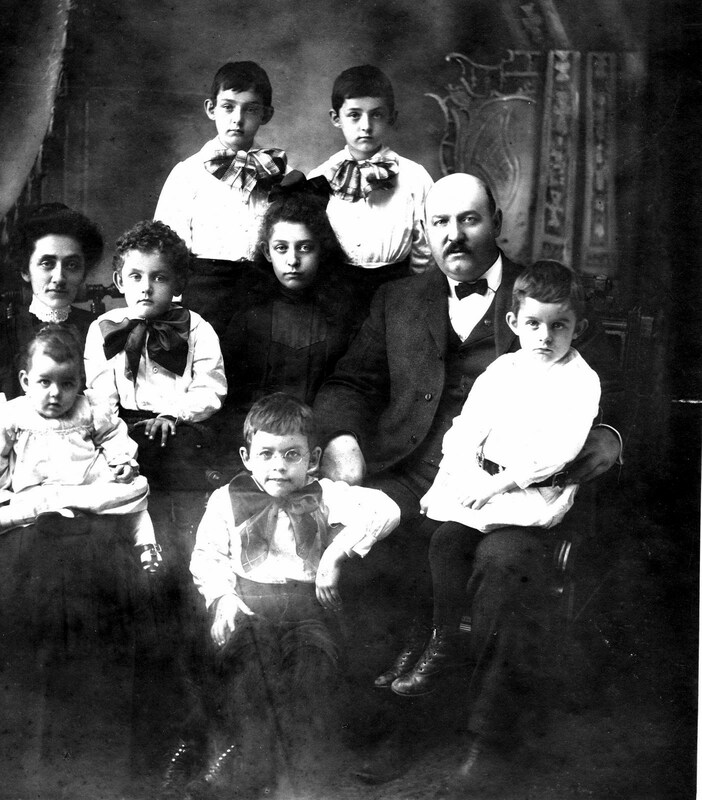 While family history is often fiction, there is some corroboration for this story. There was an article in the Calais Times reporting the fires although claiming they were set by the local Fenian leader, Dennis Doyle. It says in part “The whole river was lighted up as though a mighty army was there to bivouac for the night… The men next began to fire shots from old fowling pieces… Calais people began ringing the fire alarms…. In St Stephen, on the other side of the river, men, women and children were running through the streets. Word was sent over to them that Calais was filled with wild Irishmen, who would make an attack at daylight….” It is not at all unlikely for J.G. to have participated in or even instigated this bit of theater. His grandson, Philip N. Beckett says J.G. 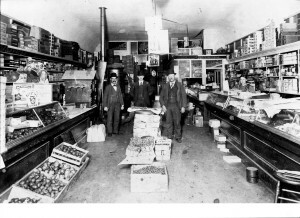 was one of the “Fenians” and his great grandson, Philip W. Beckett, recalls seeing the remainder of these old rifles in the store at 139 Main St. when he was a boy. They were lost in a fire in 1937. Given the uncertainties of the confectionery and arms business and given J.G.’s considerable experience before bars of all sorts, it is not surprising he resolved to become a lawyer. According to family legend, his obituaries, newspaper and trade articles, J.G. decided in the late 60’s or early 70’s to go to Harvard to study law. He returned to Calais a graduate of the most prestigious law school in the country and opened a practice in the store on Main Street. The 1874 Calais Business directory contains a listing for J.G. 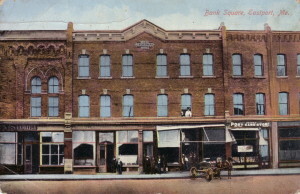 Beckett, Attorney, Main St., Calais. Frank Sr. writes” father decided he would like to be a lawyer. He had considerable experience as a client, and possessed quite a fund of general legal knowledge. So he started for Harvard and was duly graduated from the Law School.” Regarding his experience as a client, Philip W. says J.G. was known to strong arm those who owed him money and this got him into considerable trouble. Philip speculates it may have been one of the reasons he went to Law School or claimed he had. I have contacted Harvard and they have checked and double checked their very accurate and complete records of everyone who attended Harvard Law School from 1860-1890 and they assure me John G. Beckett never attended, much less graduated from Harvard. Even though Frank Sr. describes a journey his mother took to Boston to visit J.G. while he was attending Harvard and claims to have a bookcase his father purchased while at Harvard which belonged to Daniel Webster, J.G.’s legal education was acquired, it seems, as a defendant before the court, not in Cambridge, Massachusetts. While he clearly did not attend Harvard*, he must have disappeared from Calais long enough to make a credible claim to have done so. We know he was in Boston in October of 1872 because Dave and Patsy Beckett have some very nice silver, including a large pitcher, on which is inscribed “Presented to J.G. Beckett of Calais, Me by Boston Friends. Admirers of pluck and sharers in the benefits of the lightning express ox and horse teams during the Epizootic epidemic. Boston October 29, 1872.” Family history, including an account of Frank N. Beckett, Sr. claims J.G. got the silver as a reward for being a hero of the Great Boston fire of 1872 when nearly 1000 buildings were burned in the commercial center of Boston. 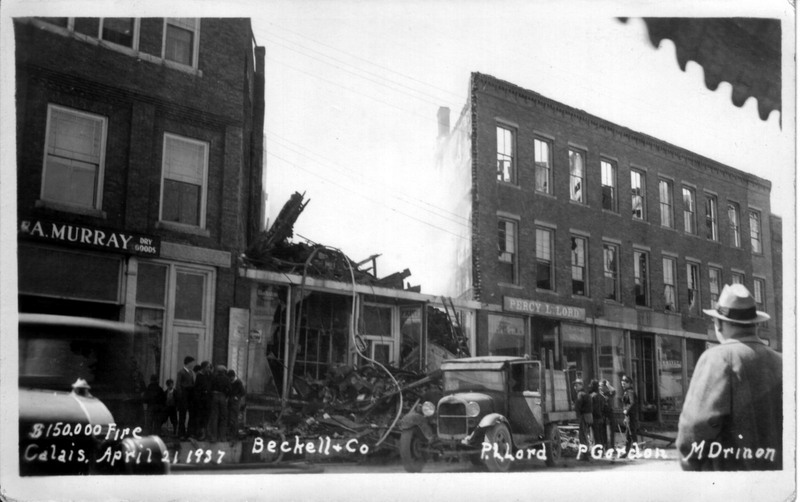 Many of the horses used to pull the fire engines and pumpers were sick with distemper and J.G., according to legend, went to New Hampshire and returned with several team of oxen to save the day. Why he was in Boston on October 23, 1872 is not clear but the reference to the oxen and horse teams would certainly give credence to the legend were it not for the fact that the Great Boston Fire of 1872 occurred on November 9th. What J.G. was actually doing in Boston at the time is unclear. 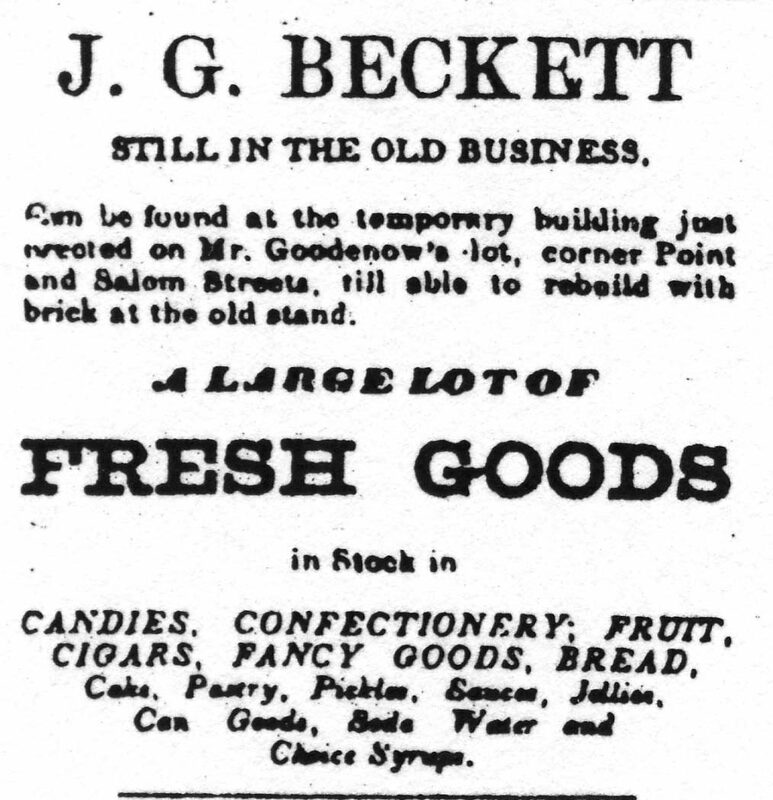 Beckett and Co was still in business with regular ads in the Advertiser and it was reported he sold his brick block to Horton in that year. Perhaps he decided after the sale to Horton to disappear for a time and return claiming he had graduated from Law School. This would fit with another family story. According to this account J.G. and his half brother Alexander decided one day to embark on an adventure. They duly cleaned out the tills of their respective businesses and vanished for about a year. No one in the family knew where they had gone or when they would return. However return they did, with a ship full of furniture acquired under questionable circumstances. Phil Beckett, Jr. says Mary Anne Casey, now Quartermain, has some of the furniture in her home in St Stephen. By the 1880’s the business and J.G. were both in bad shape. J.G.’s problem, again according to family history, was alcohol and general dissipation. In fact, surviving family members say the older boys, Frank Sr. and J.G. Jr. had their father declared incompetent and took over the business; only a court battle restored him to control. In 1886, Frank and J.G. Jr. brought out their father. Their mother, Mary Newton, had died the previous year and J.G.’s health had deteriorated further. This was the beginning of a new era for Beckett & Co. The partnership of Frank and J.G. Jr. transformed the business from a floundering confectioner and bottling operation to a substantial and profitable enterprise with sales of over a million dollars by the late 1930’s. While it would be unfair to give J.G. much credit for the eventual success of the business, it would also be unfair to be too hard on the family patriarch. He was very typical of the businessmen who settled in Calais and St. Stephen in the early years, an immigrant, tough and independent with a fondness for liquor and a willingness to do whatever it took to get by. They gave Calais a rough edge but they were also responsible for building a flourishing and vibrant international community on the St. Croix. *Correction: My statement above that J.G. Beckett did not attend Harvard Law School is not correct. After the article was published in the newsletter records came to light which establish JG Beckett did attend and graduate from Harvard Law School as he claimed although, if you call Harvard Law School today, they will tell you they can find no record of his attendance or graduation. However there is no doubt he was a student at Harvard and was awarded a law degree.